This Web log on Hurricane Katrina's aftermath is designed to help readers stay up-to-date on the various strands of this developing story. NPR.org will update this page throughout the day. With looting becoming more rampant in the flooded New Orleans, Mayor Ray Nagin said he is diverting police resources from search-and-rescue operations to control the ransacking that has inflicted costly damage on the crippled city. Nagin ordered 1,500 police to turn their attention to instilling law and order on the streets. 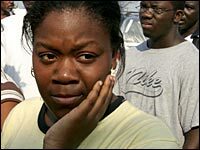 Looting has become widespread and increasingly violent following Hurricane Katrina, with people taking everything from desperately needed food and water to electronics and shoes. Another 10,000 National Guard troops are heading into the Gulf Coast region. Earlier, Nagin reiterated a call to evacuate the entire city, including the Superdome that has given many shelter. President Bush moves to release some of the U.S. petroleum reserve, and the EPA announces that it is relaxing some fuel standards, in an effort to keep prices of gasoline under control. With more than a dozen oil platforms missing from their sites in the Gulf of Mexico and refineries lacking water and electricity to get back to work, the infrastructure seems destined for months of reconstruction. The price of a gallon of unleaded gas shot up to more than $3 per gallon in many areas. Relief organizations sprang into action immediately to help out the victims of Hurricane Katrina. The Red Cross is housing nearly 46,000 evacuees in more than 230 shelters. "The imminent need is on the front burner for every agency," says Maj. Dalton Cunningham, the Salvation Army's division commander for Alabama, Louisiana and Mississippi. "The best thing to do now is just frankly to send money." In Gulfport, Miss., one of the hardest hit coastal communities in Katrina's path, most of the beachfront homes were wiped out. Sally Lohrbach, the Salvation Army's local office manager, predicts residents will rebuild. She and her husband, who works for the local power company, decided to ride out the storm in their home in nearby Biloxi so they could be ready to respond immediately after the hurricane passed. "People are amazingly resilient. Some are in shock, some are angry," she tells NPR's Robert Siegel. But she's convinced Gulfport will come back. "I don't believe the people who grew up in Gulfport will let it die... Families have been in those houses for generations. I do think they'll rebuild." There's much at stake politically for President Bush in leading the nation through this disaster, NPR's Don Gonyea reports. Thirteen years ago, when his father was president, the White House came under fire for being slow to deliver disaster relief when Hurricane Andrew tore through Florida. Analysts say it hurt George H.W. Bush in the 1992 election, which he lost to Bill Clinton. 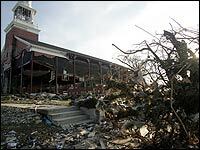 The widespread devastation caused by Hurricane Katrina is a shock to most people. But the warnings were loud and clear for those who listened. NPR's David Folkenflik notes that in 2002 the Times-Picayune, New Orleans' major newspaper, ran a five-part series warning that one day the levees would breach and city would flood. The series, as well as a similar set of stories by Daniel Zwerdling on NPR that year, concluded that the combination of man-made factors and New Orleans' location ensured that the city's flooding in a storm was "just a matter of time." With basic services lacking and floods spreading, conditions in New Orleans worsened today, NPR's Greg Allen reports. "It's about as bad as you'd expect, when there's no power, no water, roads are impassable. It's very hard to get around. It's gone from bad to worse here and conditions are totally uninhabitable." Allen describes "hellish" conditions in the Superdome, where some 16,000 people have taken refuge. While the refugees have water and food, a lack of water pressure means toilets are not working. The giant sports venue is surrounded by waist-high water, complicating plans to evacuate the facility as part of a citywide evacuation effort. Earlier today, Mayor Ray Nagin said Hurricane Katrina has taken the lives of hundreds, at minimum, but most likely thousands of people in the city. Energy Secretary Samuel Bodman says the federal government will open up the nation's Strategic Petroleum Reserve to at least one as-yet unidentified U.S. oil refiner suffering shortages from Hurricane Katrina. "We'll be able to start providing fuel oil to the refiner as soon as tomorrow," Bodman said. The move is aimed at giving oil companies an alternative to oil lost when offshore oil rigs were crippled by the storm. Katrina also took out two key shipping facilities that combined handle more than 20 percent of the crude oil imported into the United States. But despite the government's move, gasoline prices nationwide rose further Wednesday, and some gas wholesalers put caps on the amount of fuel delivered to retailers. Motorists now face pump prices in excess of $3 a gallon in a growing number of markets. There may not be any relief for weeks or months -- electricity is cut, flooding has left some important refinery equipment submerged and it will be days before a full damage assessment is completed, industry officials and analysts said. President Bush says it will take years for the Gulf Coast to recover from Hurricane Katrina. "We're dealing with one of the worst national disasters in our nation's history," he said at a news conference. "This is going to be a difficult road." The president had an aerial tour of the area earlier in the day, on his way from his Texas ranch to the White House. Mr. Bush said he appointed a cabinet-level task force to oversee the federal response to the disaster. And he asked Americans to contribute to the relief effort. Gulf Coast medical facilities are scrambling to help victims in the aftermath of Hurricane Katrina. Randy Roig, medical director for the North Oaks Comprehensive Medical Rehabilitation Unit in Hammond, La., says hospitals are running out of supplies and may be unable to treat more patients. Other hospitals are trying to evacuate patients before emergency generators begin to fail. The Pentagon, meanwhile, began mounting one of the largest search-and-rescue operations in U.S. history, sending four Navy ships to the Gulf Coast with drinking water and other emergency supplies, along with search helicopters and elite SEAL water-rescue teams. The hospital ship USNS Comfort is also en route to the area. But the ship is based in Baltimore and may not reach the Gulf Coast for a week or more. Officials say it's too early to estimate a death toll in Mississippi's Gulf Coast cities. One county alone said it had suffered at least 100 deaths. And officials there are "very, very worried that this is going to go a lot higher," says Joe Spraggins, civil defense director for Harrison County, home to Biloxi and Gulfport. Several of the dead in Harrison County lived in a beachfront apartment building that collapsed under a 25-foot wall of water as Hurricane Katrina slammed into the coast with 145-mph winds. Associated Press reporter Holbrook Mohr says many neighborhoods in Gulfport have been "completely flattened" by the wind and storm surge -- leaving literally nothing by bare trees and smashed homes for blocks. The Bush administration declared a public health emergency for the entire Gulf Coast on Wednesday, in response to the devastation of Hurricane Katrina. Public health officials rushed food, medicine and water to victims. Amid fears of potential disease outbreaks, the Department of Health and Human Services is sending medical experts from the Centers for Disease Control and Prevention to the coastal area. Residents are urged to boil water and follow food-safety precautions, as well as to avoid situations that might lead to carbon monoxide poisoning from electricity generators. More than 45,000 victims of the storm are being housed in Red Cross shelters, and the number is growing steadily. Some 250 shelters are open in the storm-damaged area, and the Red Cross says it has set up 15 emergency kitchens capable of feeding 350,000 people. Government officials say it will be months before electricity is fully restored across the Gulf Coast region. But it's still unclear how many people lack power. Bloomberg News reports that Entergy Corp., Southern Co. and Cleco Corp. -- owners of electric utilities along the Gulf Coast -- said nearly 1.6 million customers from Louisiana to the Florida panhandle remain without power in the wake of Katrina. Affected utilities say damage from the hurricane is the worst in their history. Forbes Magazine put the number of people affected at 2 million. New Orleans Mayor Ray Nagin says it will be at least two or three months before New Orleans has electricity. During that time, he says, there will be no commerce in the city, and it may be 12 to 16 weeks before residents can return. Nagin says 80 percent of the city is submerged in water that is up to 20 feet deep in some areas. The Army Corps of Engineers say Lake Pontchartrain should return to normal levels within 36 hours, at which point floodwaters in New Orleans would begin to drain. Government officials say they want the evacuation of the Louisiana Superdome to begin before the day is out, but there are many complications. The facility remains surrounded by flooded streets. In addition, The Associated Press reports that the floodwaters are threatening the generators providing electricity for the remaining lighting in the Superdome. The generator is being monitored around the clock. Wednesday morning, it was only 11 1/2 inches above the level of the flood waters. Members of the National Guard sandbagged a small area around the generator. But the underground fuel tank was covered with water so it could not be refilled until National Guard mechanics and engineers devised a way to bypass the fuel tank and run fuel directly from a truck. President Bush is scheduled to deliver a statement from the White House Rose Garden on the aftermath of Hurricane Katrina at about 5 p.m. Bush flew over areas of the Gulf Coast devastated by the storm after holding a video conference Wednesday with top aides to discuss federal relief efforts. Mayor Ray Nagin says Hurricane Katrina probably killed thousands of people in New Orleans, according to The Associated Press. "We know there is a significant number of dead bodies in the water," and others dead in attics, Nagin said. Asked how many, he said: "Minimum, hundreds. Most likely, thousands." Power companies are urging customers in Florida to conserve electricity because of concerns that fuel for their generating plants may be in short supply in the wake of Hurricane Katrina. The storm disrupted the supply of natural gas from Gulf Coast. About 17 percent of U.S. electricity is generated by natural gas-fired power plants. 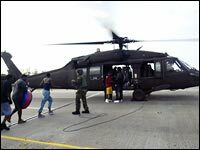 The U.S. military has dedicated at least 78 helicopters to help with relief efforts in New Orleans and along the devastated coasts of Louisiana and Mississippi. Some 8,500 part-time National Guard soldiers and airmen had been mobilized for duties from law enforcement to providing water and power generators. The U.S. Navy has sent the hospital ship Comfort to the Louisiana and Mississippi coasts, where the USS Bataan and another warship are already conducting rescue missions. The USS Iwo Jima, a helicopter assault ship, and three other vessels are also headed to the area. Youngsters from Louisiana, Mississippi and Alabama who have been uprooted from their homes may soon be attending schools in Texas. Nearly 25,000 people stuck at the New Orleans Superdome, including many families with school-aged children, will be relocated to the Houston Astrodome. Texas Gov. Rick Perry says the Texas Education Agency has been directed to provide all needed support for districts having to absorb additional children from the three Gulf states. The Texas agency says the refugee children can qualify as "homeless" and may enroll without proof of residence. President Bush is returning to Washington Wednesday afternoon. He's ending a working vacation on his Texas ranch two days early because of the disaster caused by Hurricane Katrina. En route to Washington, Air Force One descended to an altitude of about 5,000 feet to allow Mr. Bush to view some of the worst hurricane damage. He is expected to tour the region before the week is out. White House Press Secretary Scott McClellan said the government would declare the hurricane an "incident of national significance." Using the designation -- a first -- would trigger a new national emergency plan designed to allow better coordination among government agencies. The administration is also expected to request a supplemental appropriation to pay for disaster relief and recovery efforts. Louisiana Gov. Kathleen Blanco ordered the evacuation of the Superdome Wednesday morning. Texas officials offered to house 25,000 evacuees from New Orleans at the Houston Astrodome. Texas may also use the Ford Center, an arena in Beaumont, for some long-term housing for other hurricane refugees. The Federal Emergency Management Agency has promised 475 buses to help with the evacuation. Estimates of the number of refugees now in the Superdome run from 15,000 to 35,000. The sports facility had been a prime evacuation site for people without the transportation or inclination to leave the city. Refugees from the flooding continued to arrive at the Superdome through the day Tuesday -- including many hospital patients. Conditions have deteriorated at the Superdome since the storm hit. Power has been out since early Monday morning, with generators only able to provide dim light. There's no air conditioning, toilets are backing up, trash is overflowing, and the water is rising outside the complex. The 40-year-old Astrodome, which is 450 miles from New Orleans, is no longer used for professional sports. The projected cost of Hurricane Katrina to private insurance companies will be at least $15 billion, says Robert Hartwig of the Insurance Information Institute. He says there is a 50-50 chance it will top Hurricane Andrew's 1992 record of $21 billion, adjusted for inflation. This figure does not include flood damage, which is covered only through government insurance programs. Sandbags weighing 3,000 pounds are being used to try to plug the levee breaks, says Al Naomi of the Army Corps of Engineers New Orleans District. Naomi says officials do not know when they'll be able to complete the job and get the city's pumping stations back on line. Bands of gunmen are roaming through New Orleans and looting the city, according to local Homeland Security chief Terry Ebbert. Looters have reportedly gone after all types of merchandise, from diapers and ice to jewelry and guns. "The looting is out of control," says New Orleans Councilwoman Jackie Clarkson. "The French Quarter has been attacked." Louisiana Gov. Kathleen Blanco says rescuing storm victims is the priority right now, and that officials will face the looting problem as the manpower becomes available. Louisiana is working with hospitals in New Orleans to move hundreds of stranded patients to the city center by boat. The patients would then be lifted out of the disaster zone by helicopter and on to other hospitals, says Charles Castille of the Louisiana Department of Health and Hospitals. NPR's Kathy Lohr in Gulfport, Miss., says the city seems to have been sucked up by the storm and spit out onto the shore in a heap of debris. The civil defense director of Harrison County, Miss., says that at least 100 people died in the county. The largest energy terminal on the Gulf Coast, Port Fourchon, reopens today after clearing debris from the facility and surrounding roads. Port director Ted M. Falgout says it's not clear how much damage was done to pipelines and other oil infrastructure in the Gulf -- and the information won't be known until companies can take a look underwater. At least seven Gulf Coast refineries are out of service in the wake of Hurricane Katrina, and are expected to remain so for days if not weeks. About 40 percent of the nation's refinery capacity is in Alabama, Mississippi and Louisiana. The U.S. government says it will loan oil to refiners to ease the impact of the hurricane and keep production of gasoline and other fuels steady. Flooding has submerged critical electrical motors in Gulf refineries. The disruptions to the power grid have choked off several pipelines that carry gasoline, heating oil and jet fuel to other markets. Crude oil prices jumped to $70.65 a barrel overnight Tuesday before dropping to $69.25 in trading Wednesday. Wholesale and retail gas prices spiked higher nationwide. The average price of a gallon of unleaded regular gas was as high as $2.83 by Tuesday afternoon. The price of retail gas has already hit $3 a gallon in some parts of the U.S.; analysts say it could go as high as $3.20 a gallon by next week. The latest stories and analysis about Hurricane Katrina, from NPR News.